Paul McCartney delivers with Beatles classics, solo hits in long-awaited return to Madison Square Garden . Beatles Radio: The Beatles, Solos, Covers, Birthdays, News The Fab 4 and More! The long and winding road took Paul McCartney back to Madison Square Garden, where the Beatles legend proved he hasn’t lost a bit of his magic. 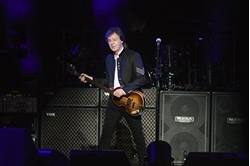 Performing his first full concert at the famed New York City arena since 2005, McCartney, 75, captivated the sold-out audience with a blend of Fab Four classics, his biggest Wings hits and even a few contemporary numbers. And if that wasn’t enough, McCartney closed out the three-hour, 40-song performance by bringing Bruce Springsteen onstage during his encore in what was one of the major highlights of the night. Clearly, it was worth the 12-year wait. McCartney got the mostly adult audience on its feet and rocking from the get-go, kicking things off with a Beatles hit, “A Hard Day’s Night,” before running through fan favorites like “Can’t Buy Me Love,” “Jet” and “All My Loving” early on in the set.